HOUSTON (AP) — When Seattle reliever Alex Colome saw Houston’s Tony Kemp knock his pitch into center field with one on in the eighth inning, he was certain it would be an extra-base hit. Guillermo Heredia made sure that wasn’t the case. 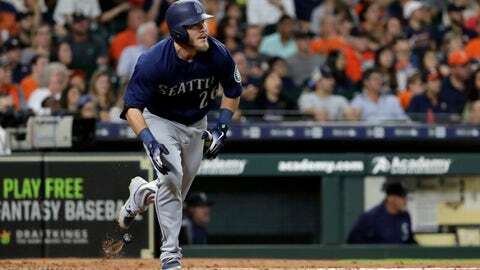 Heredia made a spectacular case to preserve Seattle’s lead, Ryon Healy had three hits and drove in the go-ahead run, and the Mariners beat the Astros 3-2 on Saturday night. Seattle trailed 2-0 before scoring all of its runs with a two-out rally in the fourth. Nelson Cruz singled and scored on a double by Kyle Seager that sailed over Kemp’s head in center field. Chris Hermann tripled to right field to tie it. Even Heredia didn’t think he would be able to get to it off the bat. Colome said the catch, which helped him extend his streak of scoreless innings to 18 2/3, was the best he’s seen while on the mound. The Astros took an early lead on a two-run single by Tyler White in the second. Houston didn’t have another baserunner until White walked to open the fifth. But LeBlanc got three routine outs to end the inning and his night. Mariners: RHP Erasmo Ramirez, who hasn’t pitched since April 27 because of a shoulder injury, will come off the disabled list to start on Sunday. Houston left-hander Dallas Keuchel (9-9, 3.53 ERA) opposes Ramirez (0-2, 10.24) when the series concludes on Sunday. Keuchel has won six of his last seven decisions and allowed just three hits and one run in his last start but did not factor in the decision in a 2-1 win over the Giants. Ramirez is taking Felix Hernandez’s spot in the rotation after the longtime Mariners ace, who has struggled all season, was demoted to the bullpen on Thursday night.